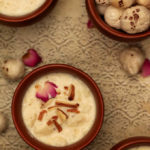 Makhane ki kheer is a popular festival recipe. It is light and very easy to prepare. This traditional Indian dessert pudding is made with makhanas slightly roasted in ghee and then cooked in milk with coconut. In a wide mouth kadhai/wok, heat 1 tsp ghee and lightly roast the makhanas. Just about a couple of minutes. Transfer the roasted makhanas in a zip bag, close, and then coarsely crush with a rolling pin. You don’t want it to become a powder. In the same pan that was used for roasting the makhanas, add milk and bring it to a boil. Add the crushed makhanas, grated coconut and half of the almonds in the milk. Cook on low-medium heat with frequent stirring for about 10 mins. Add in sweetened condensed milk, stir and cook for another 5 mins. Mix in green cardamom powder and remove from fire. Pour in individual serving bowls and garnish with slivered almonds and, if you have them handy, some rose petals for added festive feel. Can be served both hot and cold. I love it cold so I chill it for at least 2 hours before serving. *If you want to make makhana kheer without condensed milk start by using 2 ltr milk and reducing the milk to half over a low flame. Takes about 45 mins to an hour. and then add about 1 cup sugar along with makhanas and coconut.